Even if you’re the best speaker in the world, you’ll struggle to give the best presentation in the boardroom without the right equipment. Presentation clickers are some of the most important equipment you should to have on your side if you want your presentations to rock. They are certain make your presentations more professional and vivid. Essentially, they are designed to help speakers have more freedom and flexibility when using PowerPoint, Keynote or any other program. The wireless device allows advancing your slides at a distance while walking freely in the presentation room. As a result, they improve how you engage and interact with your audience during a presentation. What’s more, most clickers are compatible will all computers operating software such as Windows, Mac or Linux. Ultimately, a quality presentation clicker will advance your slides without any hitch. And the majority of models nowadays come with advanced controls and functionality. They make it easier for you to start, stop, go back or highlight the key points in your slides with no difficulty. In this post, we review the top 10 best presentation clickers in the market today. We hope this post will help you find the ideal device for your needs. Shall we? 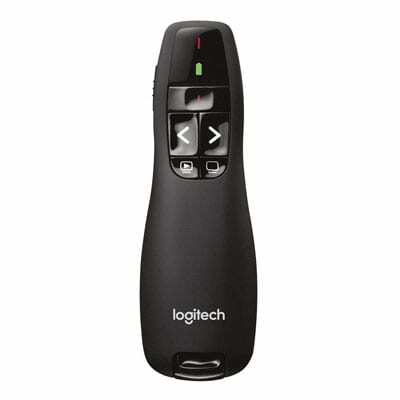 Logitech R400 is one of the top presentation clickers to consider whether you’re a student, teacher or corporate executive. The device comes with user-friendly keys which allow you to control your PowerPoint presentation with ease. Its sizable range (up to 50 feet), gives you more freedom to move around when presenting to your audience. Besides the clicker has a miniature USB receiver that’s compatible with most computers. And to make your presentation more engaging and vivid, you can utilize the laser pointer to highlight or stress key points in your slides. It also works perfectly well on both white and grey projector screens. What’s more, syncing the device with your PC is automatic; you won’t need to install any software provided there’s a wireless connection within reach. Moreover, R400 is compatible with Windows 10 and Vista. In the end, this is a solid product worth purchasing. You won’t have to worry about battery performance issues as the remote’s AAA batteries can last up to 20 hours. 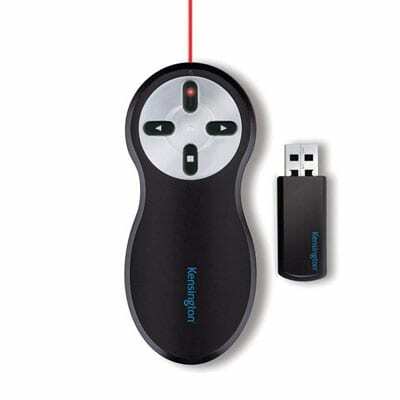 If you’re only searching for a basic presentation clicker that will do the job perfectly, consider Kensington Wireless presenter and you’ll not regret any bit. This is one of the best sellers in the market. Many customers love the clicker because of its compact and ergonomic design, if not for its expansive range (65-feet). If you end up buying this presenter, you’ll appreciate its comfortable size and the way it perfectly fits in your hand. Besides, the four-buttoned design gives you more options when controlling the flow of your slides. The laser pointer feature on the other hand gives you the freedom to highlight critical points in your presentation. The wide range allows you to walk around the room with freedom when making your presentation. On connectivity, this is a dependable device as it connects with both Windows and Mac system via a USB receiver. No additional software is required when connecting it with your PC. Syncing between the two devices occurs automatically. Red Star Tec Wireless Remote clicker is another top choice worth your consideration. The device is wireless by default, so you don’t need any wires or Bluetooth when connecting it to your PC (Windows or Mac) or tablet. Also, you don’t require any additional driver when syncing it with your PC. However, it’s crucial to note that 2 AAA batteries are not included in the package. 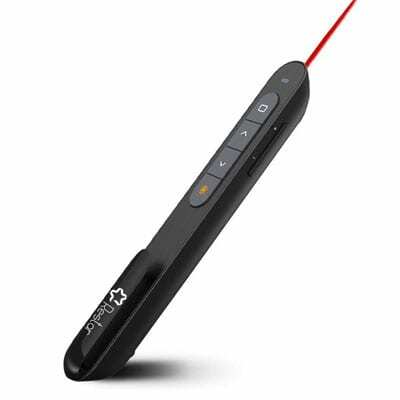 All in all, Red Star Tec Wireless Remote clicker is a quality option to consider if you’re looking for a reliable and versatile presentation clicker. Moreover, the product is nicely boxed that you’ll likely mistake it for a gift. August LP200 Wireless Presenter is another good choice you should seriously consider. The clicker comes with shortcut keys designed to help you intuitively advance or control your PowerPoint slides on the go. You’ll have no trouble using the remote device as all you need is to plug and play and the device will sync with your computer automatically. This is possible because of the USB receiver, which enables you to quickly sync the clicker with a Mac or Windows PC. And the good thing is that it’s compatible with Windows 7,8,10, Mac OS and Linux. It only takes a matter of seconds to get the connection right. What’s more, when you buy the presentation clicker you get a free eBook with lots of tips and tricks on public speaking. 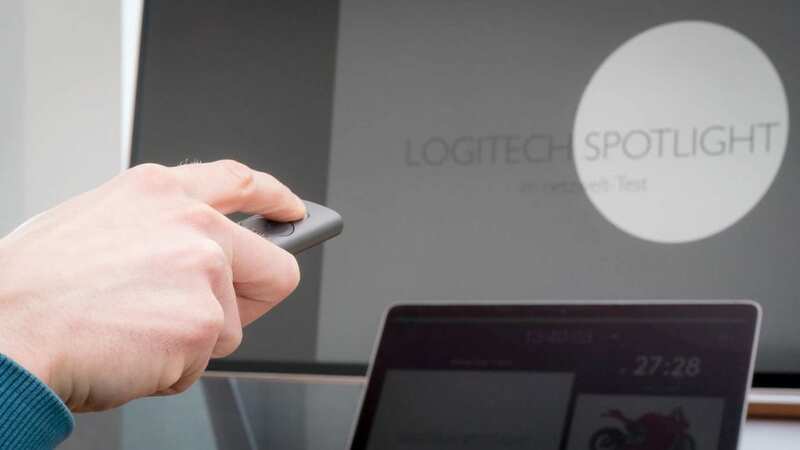 To finish, if you are looking for a compact and lightweight clicker that will add professionalism to your presentation, August LP200 Wireless Presenter is a worthy candidate to think about. Breett 2.4GHz Presentation Clicker is among the best remote devices in the market based on customer feedback on Amazon UK. 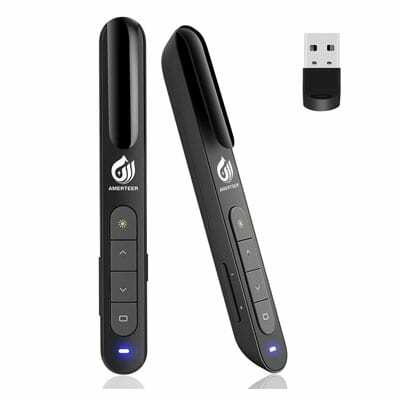 The wireless presenter is easy to pair with a PC because of the plug and play feature. Essentially, you’ll not need any drivers to start using it and it works perfectly well with Windows 2003, XP, 7, Android Mac OS and Linux. Besides, it supports variety presentation software such as PowerPoint, Prezi and Keynote. The presenter has enough of key shortcuts to make the job of controlling slides simple and seamless. If you’re looking for more range; so that you can move around with freedom when making your presentation, consider this clicker. It has a wireless range of up to 100 meters—which is quite impressive when you compare it to other alternatives in the market. Additionally, it comes with a rechargeable battery. Beboncool wireless presentation clicker is made with environment-friendly materials and comes with a laser pointer for highlighting essential areas of your slides. You don’t need any software when pairing it with your PC, due to the plug and play feature it comes with. It’s compatible with all Windows and Mac operating systems. Also, it has a considerable range of up to 39 feet, so walking around the room should be a breeze. With the help of well-designed buttons, it’s easy to move from one slide to another. You’ll also get good service form this clicker because it has a long lasting battery. The Amerteer wireless clicker comes with a moderate distance range of 39-feet, which should be enough for walking freely in a large room. Its four-button controls allow any user to navigate or switch from one slide to another faultlessly. The laser pointer features make it easy for one to highlight any part of presentation intuitively. Also, the device can be set up to connect with your PC (Windows or Mac) through the plug and play functionality. What’s more, the thin design allows it to be stored easily in a bag or pocket anytime. Lastly, the device uses only one AAA battery. 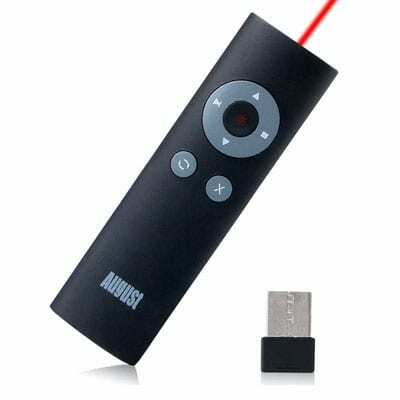 With dimensions of 13.8 x 2.8 x 2 cm, and a range of over 100m, JSVER Wireless Presenter Laser Pointer is worth a mention. The presentable clicker comes with a rechargeable battery hence you don’t need to worry about your battery running flat. The upgraded version comes with flexible button options that you can use to advance your slides. You can also switch window tab, increase or reduce volume, click hyperlinks, play videos, etc. In addition, you don’t need extra software when syncing the device with your PC because of its plug and play feature. Moreover, the remote is compatible with all Window, Mac and Linux systems. 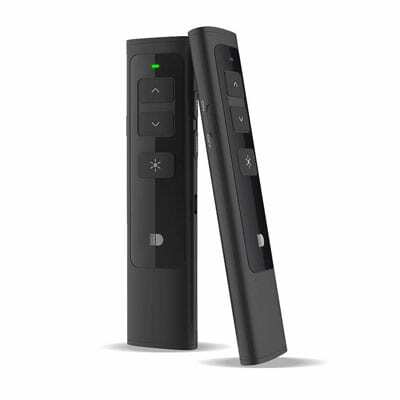 The Doosl Wireless Presenter is also among the top-ranked clickers on Amazon. It uses AAA battery which is easy to replace and connecting it to a PC or tablet is automatic because it comes with a Mini USB receiver. It has a substantive wireless range of 100m thus it’s easier to walk around a large hall when making your presentation. The clicker comes with enough buttons to scroll the page up, down, exit or click full screen. It also supports a variety of presentation applications like Prezi, PowerPoint and Keynote. What’s more, the clicker is power efficient as it comes with an extra switch for enabling power conservation. 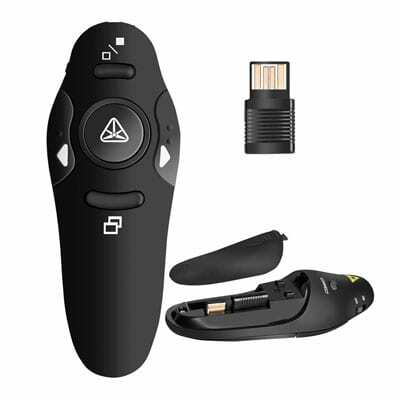 Although last on our list, Restar Wireless Presentation Clicker is an impressive device worth getting. The clickers a substantial wireless range of 100m, meaning users have the flexibility to walk around a big room while presenting. It also comes with laser pointer which allows the user to highlight the essential parts of any slide. In addition, you only need one AAA battery to power on the device and its compatible with both Windows and Mac systems. Besides, you don’t require extra software to connect the device with a PC because it comes with a plug and play feature. Lastly, it contains enough button options to advance slides in any direction you want be it up, down, forward, backward, etc. Wireless presenters can make or break a presentation. If you want to present your ideas professionally, it’s highly advised that you purchase a wireless clicker to advance slides with simplicity. The clickers also enable you to walk freely in the room so that you engage and wow your audience. Because wireless presenters come in different shapes, sizes, and budget you shouldn’t rush your purchase decision. Here are some of the key factors to consider when acquiring these handy devices. On the surface level, most presentation clickers look the same in term of design and functionality. As result, the only way you can distinguish one device from the other is by looking at features on offer. Ultimately, it’s your needs that will determine what features you select. Remember, you may have to pay a little bit more in order to acquire a presentation clicker with more advanced features. The design is another important factor to keep in mind when purchasing presentation clickers. One key design consideration that you should always factor when shopping for a clicker is the number of buttons. Ideally, presentation clicker should have a moderate number of buttons. Many buttons can cause constant misclicks when presenting. Also, the type of battery used is an important factor you cannot overlook. You should give preference to AAA batteries because they are easy to replace. All in all, it’s important to evaluate how a presentation clicker is designed prior to making a purchase. Lastly, when buying presentation clickers ensure you only deal with suppliers with great customer support. This means transacting with manufacturers that can easily be reached via online chat, email, phone, etc. In addition, check warranty information when you buy these devices. Remember, the length of the warranty will differ from one manufacturer to another. Some come with 90 days warranty, while others can extend up to 5 years. This review post covers some of the best presentation clickers in the market. We arrived at these choices after countless hours of research and testing. We purposely did all the work so don’t have to go through the same process again. Ultimately, your ideal presentation clicker will depend on your needs and budget. Happy shopping!